It’s been almost two years since I left my first airline; a domestic, budget carrier that operated turn flights on single-aisle aircrafts. As soon as I went to International—with the fancy uniform and (some say adorable, some say horrible) hat— most thought that I was making a strategic career advancement. I would have better pay and a nicer quality of life, both of which are untrue. I gave up a lot, but I also gained a lot. I risked for an experience and although there have been moments of regret, hands-down, 100 percent, I would trade domestic for international again. But, probably for not the reasons you might guess. The main reason I am glad I went for this International adventure is because I cannot see my life without the people that I have met because of my job. The people make the places special. The people make the job worth it. I’ve thought about the ways I never expected to change by taking this job and the things that have changed for me because I fly International now. I haven’t listed all of them, because there are so many nuances that are part of my everyday life that I truly never expected. For example, I can never find American currency in my wallet (which I probably should have expected, but didn’t really think about). Anyway, without further introduction, these are the other things that I really didn’t think about before jumping into a new job. 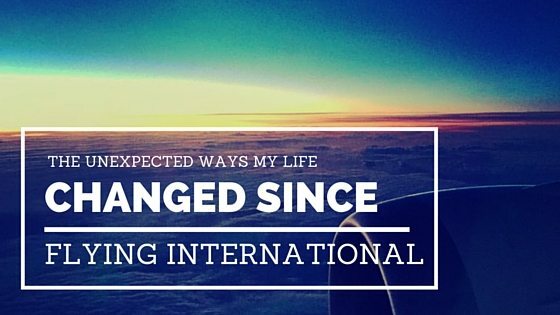 These are the ways that my life unexpectedly changed since flying international. I began a love affair with Avocado Toast: just don’t even get me started on my love for Avocado Toast. I really had no idea my life was completely missing Danish rye bread, avocado, and perfect lactose-fri cappuccinos in Copenhagen. I have to have avocado toast all over the world now. I drink an unnecessary amount of coffee: There was a time at the beginning, and even a few years into my flight attendant life that I didn’t drink coffee. I know— I’m as surprised as you are, but there are two explanations for this. One; I didn’t blog then. And two; I never worked a redeye or switched time zones. Ever. Now that I never know what time of the day or night it is, I can drink coffee anytime of day or night. Always a positive side to everything. I make a less money: I got a lot of days off and made a lot more money at my previous airline. Why would you ever leave you ask? Well, sometimes it’s not all about the money. Sometimes it’s the experiences that are worth more than gold. Seniority doesn’t exist: Yep. You read that right. It’s supposed to encourage equality I think. It might sound like a good idea in the beginning, but it does become confusing when vacation is divvied up or days off are requested. We don’t bid, so that’s not an issue. and as mentioned, I don’t bid: I get no choice over a schedule, which is annoying on one hand and nice on the other. I can never forget to bid and reserve is only in 2-4hr blocks. I’m thoroughly convinced a flight attendant (myself) can become accustomed to anything; that is except jet lag. Swedish chocolate and Joe & The Juice are part of everyday crew life: Both of which will change your life. One of which will change your waistline. Unfortunately. There are no American pilots: Bonus. My trips are 7-16 days long: Which should mean that I am good at packing. The truth? Only sometimes. I finally like Ft Lauderdale: FINALLY. It’s a miracle. Took two years. Buying a bicycle, kite gear, and finding a great blogging spot have significantly helped. I will miss it if, and when I leave. Hi- Love all the information here. Thanks for what you do! I currently am a photographer and have my own business. Super fortunate to have been in business for 20 years. I am looking for information that can help me decide which airlines to pursue so that I can continue working as a photography part time. I know that southwest has a 3 day on, 4 day off work week, just wondering what other airlines operate the same way? Does Southwest have agreements with other airlines so FA can travel internationally? Also wondering if mainline airlines are as flexible and what reserve life looks like? Thank you so much for your time. Happy travels.